Characters spread across three continents prepare for war and cataclysm in Wolf's debut novel, the first part of a trilogy. East and west, north and south are set to collide as the inhabitants of a magically ravaged world compete for dwindling resources. In the east, the Forbidden City's emperor breeds a half-human army for conquest, and in the west, the Dragon King, the world's most powerful sorcerer, rules from an obsidian castle. But in the harsh, predator-infested deserts of the Middle East—sorry, the Zeera—the fierce and nomadic Zeeranim struggle to maintain their way of life independent of the outside world's politics. As they happen to be sheltering the Dragon King's former queen and long-lost heir, that's a tall order. Hafsa Azeina fled the Dragon King years ago with her daughter, Sulema, and found succor with the Zeeranim, becoming a dangerous sorceress while Sulema—in the best tradition of redheaded magical princesses—became the most formidable warrior of her adopted people. The cast hardly stops there (the appendix of characters runs for six pages), but it is the arrival of Sulema's half brother, searching for her, which triggers a chain reaction of intrigue and betrayal...resulting in Sulema's return to the Dragon King and infighting among the Zeeranim. Will Sulema ultimately accept the world-saving responsibilities of her birth? 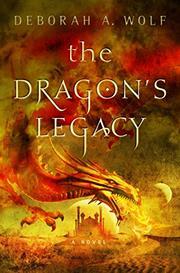 Will her mother survive the Dragon King's vengeance? Excellent questions, which aren't answered here: remember, it's just Book 1. Wolf's debut is ambitious but staggers under the weight of its own epic pageantry. There are intriguing worldbuilding and poignant moments to be found here—but they're half-buried beneath invented fantasy terms and constant reiterations of how scary the magicians are. Wolf writes for a big screen: the smaller, human moments struggle for room to breathe.